New Orleans took a terrible hit in 2005, JBP keeps the music alive. 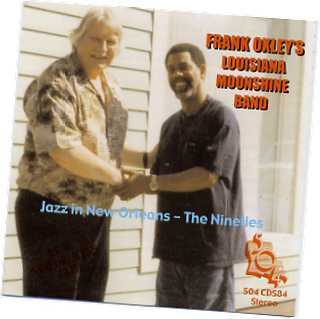 Frank Oxley's Louisiana Moonshine Band. 504 Records, CDS 84. The raffish racial hot-pot that was New Orleans at the turn of the 19th and 20th Centuries produced by some miracle of chemistry a vital form of music which proved to be the deepest cultural contribution made by the United States of America to the world. It was a contribution at once unique and infectious. The maverick city is now drowned and deserted. The supposed rescuers of its stranded people appear to have ignored the black population, mostly poor, without whom this music could not have been born, and lifted instead the white inhabitants, mostly well- off, while armed soldiers patrolled to deter looters, presumed to be black. With New Orleans musicians scattered, possibly never to return, it's time to reassess the state of its traditional jazz, which has changed and developed over a hundred years. 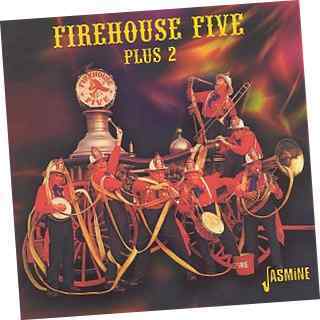 Only diehards and ideologues still insist on what became the stereotypical band - trumpet, trombone, clarinet, banjo, bass, drums, with a repertoire largely based on endless versions of traditional tunes. This format established itself initially largely due to convenience - the instruments were available - and jazz musicians came over the years come to realise again the force of Jelly Roll Morton's insistence that jazz is not what you play but how you play it. The liveliest surviving bands now mingle standards with tunes from any period - hymns, folk tunes, marching tunes, popular songs, spirituals, blues, ragtime, boogie, compositions of their own, rock numbers and so on. Since ragtime, one of the precursors of jazz, was essentially piano music, the piano became basic to jazz, and appears in New Orleans style bands more or less as often they can afford the instrument and the pianist. During the jazz revival of the Nineteen-forties and Fifties it was often mistakenly believed that purity and dedication required the clarinet to the exlusion of any variety of saxophone. In fact the saxophone appeared early in jazz history and during the late twenties and early thirties the Luis Russell band, driven by New Orleans trumpeter Henry 'Red' Alien, contained the wonderful alto player Charlie Holmes, whose lyrical drive on that instrument has never been equalled except by 'Captain' John Handy, a formidable presence in New Orleans itself. Handy was playing for many years before Jazz Crusade, GHB and American Music began to record him during the nineteen sixties. Handy was a soaring, irrepressible soloist who enlivened and transformed any group of which he was a member. It was larely owing to his influence that in British jazz two of our finest clarinet players, Sammy Rimington and Brian Carrick took up the saxophone, alto for Rimington and tenor for Carrick. Those sessions in which they play saxophone are always outstanding. The track (a version of 'Does Jesus Care') on Jazz Crusade's 'Watering the Roots' CD on which Sammy plays clarinet and Sarah Spencer's rollicking tenor crosses over and enriches his pure tone is a masterpiece to be treasured if you can get hold of it. At this time of crisis for New Orleans music it's a joy to listen to a CD recorded in Algiers, Louisiana, but only now released. It's the fruit of a gathering of accomplished enthusiasts from Britain who join two in New Orleans to attain an immediate rapport. They may not be the greatest band alive - trumpet a touch hard, trombone limited - but they play with that mixture of tact and vigour which achieves unity of purpose from the authentic interchange of emotion and character. It's an orthodox combination, and Brian Carrick doesn't play his tenor, but his lucid clarinet brings distinction and depth. Real jazz is the music of NOW, each session an adventure of improvisation and relationship. This one is characterised by a refreshing relaxation which derives from the ease evident in one another's musical company. Our strange, varied, irregular and beautiful island still harbours a wildly unlikely profusion of players of traditional jazz, who will keep going, despite the death of the city where it was born. Perhaps New Orleans musicians will make pilgrimage to join us in Britain, Sweden, Denmark, or France, just as our musicians made pilgrimage to New Orleans when it was so rich and thriving in music that it seemed as if life intended mere human beings to gain the ability to celebrate as naturally as birds. Harlem Hot Stompers: Senior Moments. PEKCD-281. August 2005. Yes, they're seniors, and don't come from Harlem, but they are as full of life as jumping lambs, and play like men happy in each other's company. The CD would be worth buying for two particularly inspiriting tracks, even if there was nothing else to get you up and moving, in fact several other numbers are infectious. The two special tracks are Shufflin' Time and Flow Gently, Sweet Afton. Both jump and both swing, have a zest which greets the sunshine if it's there and conjures it if it's not. There's a surprising and accomplished harmonica solo on Afton, John Reade is a genuine ragtime pianist, which he demonstrates on Cakewalk, and Tony Foulkes plays all his three instruments with equal felicity.. They tackle Jelly Roll Morton's Georgia Swing and Jimmy Blythe's Oriental Man with equal conviction, which demonstrates unusual versatility. They always know what they're doing and where they're going and they enjoy the journey. You can tell which tunes give them the most plesure by the time they they spend romping about with them. Afton runs for 7 mins 36 seconds and every second counts. Another reason for commendation is that there are only two efforts at singing. Every musician in every New Orleans type band seems to have an irresistable desire to sing. We'll forgive these two because their CD is fun. 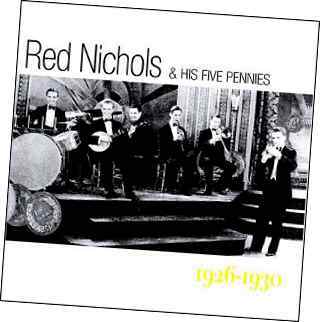 Red Nichols & His Five Pennies. 2005 reissue of material from 1926-30. Red Nichols, a highly educated cornet player, and his various groups, were the most frequently recorded jazz bands of the 1920s. Their music was pleasant, technically accomplished, bright, and guaranteed not to offend anyone, while giving a distinct jazz impression. As a result they were responsible for widening the audience for jazz among a respectable white clientele. The groups included at one time or another authentic jazz musicians like Pee Wee Russell, Jack Teagarden, Benny Goodman, Eddie Lang, Fud Livingston and Joe Sullivan, as well as expert jazz joker Adrian Rollini. It must also be said that Nichols's most regular colleague Miff Mole, was a brilliant and innovative trombone player,despite looking like a modest and retiring bank clerk. Then why do the recordings lack the drive, dash, danger and passion of authentic jazz? No doubt commercial success and the expectations of record companies prevented any outbursts of wild exuberance. Yet for a few minutes on 'After You've Gone' the veneer cracks and they show what they could have accomplished, as a fresh breeze of joyful enthusiasm blows through the studio. In 'Feelin' No Pain' and 'Five Pennies' too, the inspired squeaking of Pee Wee Russell forces odd movements of the feet. This is a two-disc revival of recordings made between 1949 and 1971. Further collections are to follow. The Jazz revival of the 1940s produced a wide variety of music from the fanatical New Orleans orthodoxy of Ken Colyer and the relentless dedication of Lu Walters and his Yerba Buena Jazz Band, through the awkward resurrection of Bunk Johnson to the rumbustious enthusiasm of Firehouse Five plus Two, a gathering of accomplished musicians playing rumbustiously for fun. The dangers for this and similar groups is that on occasion their humorous effects and driving levity may seem to patronise the music that gives them life, but they are formidably accomplished, and occasionally achieve lift-off into a form of supercharged flying. They specialise in fast tempos, regularly exceeding the speed-limit in built-up areas, but, ironically, the masterpiece in this collection is a mid-tempo rendering of Wabash Blues, where they feed off each other's sincerity and enjoyment to produce a classic. The founding members of the group were all on the staff of Disney Studios - animators, technicians, writers - and the two-job existence became so strenuous they were forced to close down for a year in the nineteen fifties. They returned refreshed and became extremely popular, their Disney salaries enabling them to pick and choose which gigs they accepted. Their longevity as a band demonstrates remarkable ability and stamina. New Orleans Jazz start page.